FreeBSD ports is a vast make system for all of the third party software that has been ported to FreeBSD. This is one of the major source code repositories on the net. Here are the steps to get it working with OSX. GNU-Darwin users should adapt these instructions accordingly, and no data recovery will be needed later. If you are a Darwin-x86 user, then consult the GNU-Darwin installation notes for Intel users. Until we get more maintainers on board, this procedure is for developers only, and users should resort to the packages. Root access is highly recommended to use the porting engine at this time. These instructions assume you have already installed the GNU-Darwin base files. Make sure you have the latest release (at least g-d-package-install-2a.10). Having a look at Using the Ports Collection from the FreeBSD Handbook might not be such a bad idea after all. 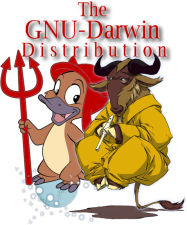 Get the GNU-Darwin ports archive and untar it as follows. Get /usr/share/mk and /etc/mtree from CVS. When prompted for a password, simply press the Enter key. Update /usr/ports/Mk folder through CVS. "cd /usr/ports" and find the directory with the application you wish to install (you can use make search name=packagename). Change to that directory and type "make install". If all goes well, then the ports system will automatically download the necessary files from the internet, compile the sources, and install the application. If not, the CVS repository always contains a number of updated ports as well as updated Mk Makefiles so it is always a good place to look around. You may also want to take a look once in a while at the developers resources page for new developements and CVS updates. This GNU-Darwin porting engine has been used to automatically compile over 15000 programs for our users. All of the ported applications are fully OSX compatible, so that MacOS users can learn about the benefits of free software. Here is a comprehensive list of the software that is found in the ports collection. Most of these can now be fairly easily ported to GNU-Darwin and Mac OSX. Take your pick! To check our progress with a particular port, try the package directory.